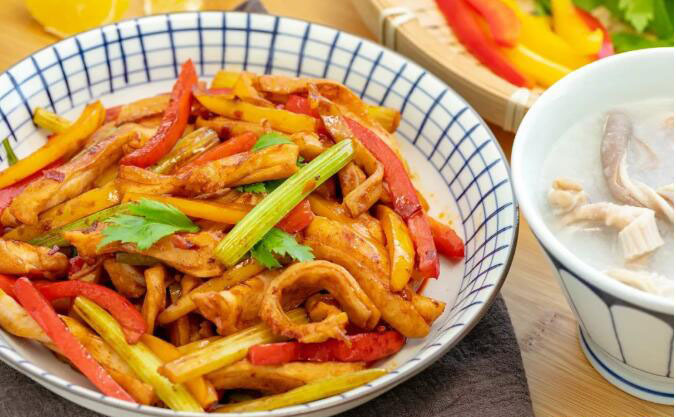 This steaming, delicious dish is enjoyed all over China! From young to old, rich to poor- this is the food that brought everyone together! Dai pai dong can be found in all cities in China, and is enjoyed by all facets of society. Wherever there are Chinese people, there is always Dai pai dong. The true test of craftsmanship on this dish is preparing the pork stomach (Hog Maw) correctly. However, today I am going to share with everyone a Dai Pai Dong recipe that anyone can make easily at home and enjoy! As I said before, the pork stomach preparation is very important, and if you don’t do it correctly, it will not turn out correctly. The first is to buy the freshest pork stomach you can find. It would be something that you can find at a butcher shop. Second, you must remove all the materials on the outside of the stomach as shown below. These materials on the pig’s stomach are the source of the bad scents. It must be very thoroughly cleaned, and it will taste delicious and be odorless. Third is the heat. The average home stove cannot get hot enough to cook all the ingredients like they would in a restaurant. Therefore, as explained in the steps below, there is a special cooking method that must be followed so that the stomach does not get tough and chewy. Finally, there is only a certain part of the pork stomach that should be used for this recipe. The thickest part of the stomach, the tip which makes up about ¼ of the whole stomach, is best used to make this. As shown in the picture below, the blue, solid area is the best part to be used in this recipe. If you feel that this will not be enough, the area in the dotted line can also be used. Step 1. Heat the wok on high heat. With a washed pig stomach, sear both sides for a few seconds, then rinse it in cold water. Rinse the wok and repeat 2-3 times. Step 2. Rub the stomach with salt and starch, and rinse. Step 3. Cut the area that is going to be selected for cooking in this recipe as explained above. Step 4. Cut into about ½ inch strips. Step 5. 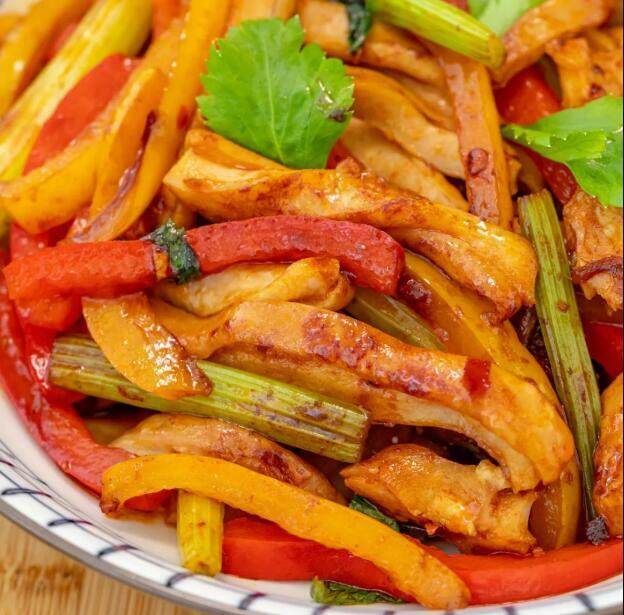 In a bowl with the strips of stomach, add a small amount of ginger, salt, white ground pepper, a few drops of white wine (cooking wine), mix with a little starch, and coat evenly. Finally, pour 1 teaspoon of cooking oil and mix well. Step 6. Heat a pan, add a little oil and put in the strips of stomach. Stir fry until white (about 1 minute), and then remove and set aside for later. Step 7. Heat the pan again with some cooking oil. 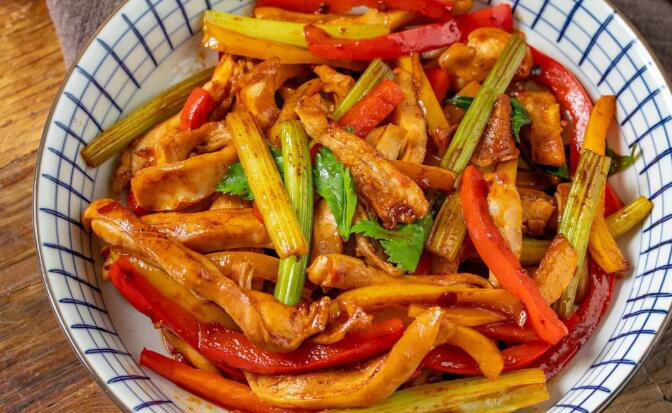 Add the ginger, garlic, green onions, add 1 tablespoon of doubanjiang, stir-fry. Step 8. Add the pepper and celery and stir fry evenly. Finally, add the pig’s stomach, add salt, light and dark soy sauce, and then turn off the heat. It is now ready to enjoy!